Years ago I digitized all my CDs (also known as "ripping" CDs). I did this by using Apple's iTunes product which "imported" the CD's contents when it was inserted in the DVD/CD reader on my laptop, and I asked iTunes to save the CD to disk using their "lossless" format, which is discussed in the original text below. As mentioned in the original text, you have the option of "cleaning up" any textual import errors, like the spelling of the artist's name, album or song titles, or the genre. I have a "whole house" music system: basically an amplifier which takes multiple inputs, controlled from wall switches in many rooms, and feeds the sound from that input to speakers in the ceiling. The concept here would work the same for any amplifier which feeds any speaker. I purchased (as a replacement for my Squeezebox) a Bluetooth Streaming Audio Adapter, which connects to my iPad via Bluetooth and outputs its signal to the same amplifier I used previously. The exact model I bought has the incredibly long name, TP-Link NFC-Enabled Bluetooth 4.1 Receiver, Wireless Audio Adapter Streaming Music from Echo Smart Phone Tablet PC to Home Car Stereo Sound System (HA100). Clicking the link should take you to it. I paid $22, plugged it in, connected it via Bluetooth, and it worked instantly and flawlessly. It's only a couple of inches in size as seen in the image below. I now use my iPad to access my entire music collection via Apple's Music app: . Don't have an iPad? Use your iPhone or Android device. That said, I also use my iPad to play music from Pandora via the same system. Whatever music app you use on your iPad or iPhone or Android device plays through your speakers. For many years I wanted to digitize my music CD collection and be able to control and play the selections via my home audio system (which is actually connected to a "whole house" audio system with speakers and controls in multiple rooms). I finally figured out how to do this, and here is a description of my system and the steps involved to set it up. The product described here was discontinued in all versions by Logitech in August 2012. Similar products may be available from other companies, but I am not familiar with them. The information is maintained here to familiarize you with the steps involved! All my CDs digitized ("ripped") to a hard disk (external to my computer, so I can easily move it to a different computer later). This form of copying CDs is perfectly legal (as long as you own the CD). A software control program to organize and access the music (mine is called Slim Server and is free). 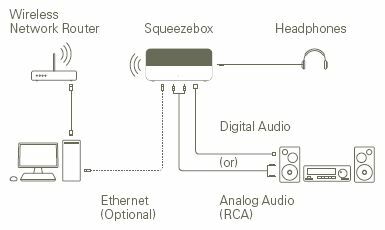 A hardware device to convert the digitized music to a "line out" signal to pass to a home stereo. This device (a Squeezebox in my case, pictured below) communicates with the server and me (via a hand-held remote or the software). First, I should point out that I have a home network consisting of a router and other family computers. The items below were installed on my laptop. You do need a router or a server to which the hardware device (Squeezebox) connects via TCP/IP, either using an Ethernet cable or wirelessly (which was my choice). I purchased a standalone hard disk. I wanted at least 100 GB, but I bought a 250 GB Western Digital "My Book" hard drive which plugs into the USB port and has an external power supply. I paid only $75 after rebates, so I feel I got a good bargain. I reformatted the hard disk (per the instructions) from its native FAT32 format to NTFS. Then I decided to divide it into two partitions, one of which would be devoted to backups of other software, since I didn't need all the space for music. FYI, each CD takes up, on average, 300 MB using the method described below. 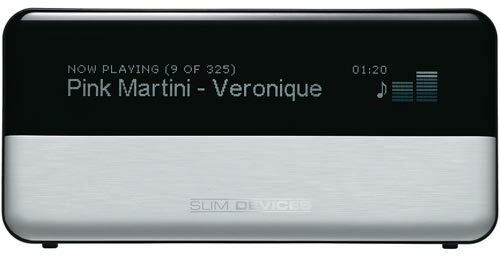 I ordered a Squeezebox by Slim Devices (www.slimdevices.com [the link now takes you to Logitech]). It cost $299. An alternative, less expensive product might be a Roku Soundbridge (www.rokulabs.com [the link now takes you to Roku])). Try this search to find more: http://www.google.com/search?q=network+music+player. While waiting for it to arrive, I ripped all 300 or so of my CDs using iTunes, free software from Apple. I did not own an iPod at that time, but anyone can use iTunes. The reason I used iTunes is that I wanted to store my CDs in what is called lossless format, and Apple has a good one. Lossless formats (there are several of them) take up a lot more storage space than lossy formats (like MP3), but you retain musical integrity. Since I was buying a separate hard disk, what the heck, I had the space! I am told that Windows Media Player also has a lossless format, but it takes up more space. FLAC is the name of another such format, and there are various products which you can use to rip CDs losslessly. My CDs take up about 300 MB each. I did not choose to use error correction (which was recommended by a friend) because it took too long to rip each CD; however, doing so would help avoid occasional dropouts, a problem I did discover later. I fed my CDs to my CD ROM one by one over several days while doing other things. Each one took several minutes to rip. Occasionally a CDs information couldn't be looked up online properly, so I deferred those CDs to handle later, manually. I installed Slim Server (free software from Slim Devices' website), which is now called Logitech Media Server. It is controlled primarily via your browser. The images below are not from the current software, but they are similar, to make the points. On the left side, you control the library; on the right side, you control the Squeezebox (such as building a dynamic Playlist and telling it what to play next). You can even access this server from another computer connected to your internal network. I setup a few parameters, including scanning my entire new music library to organize it for use with my Squeezebox. 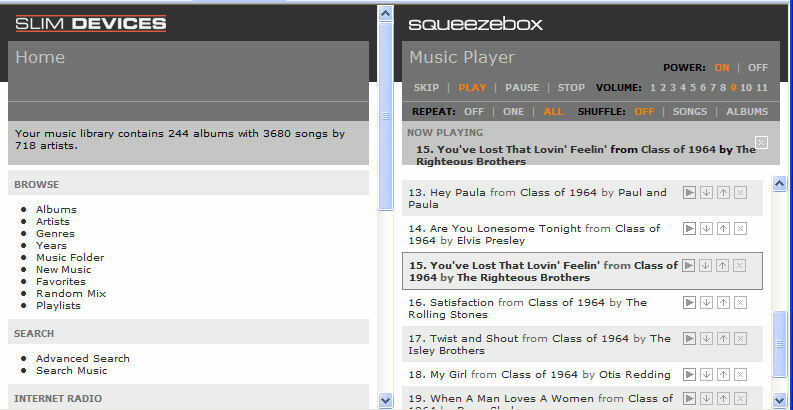 When additional songs are added, the Slim Server finds them automatically. When the Squeezebox arrived, I unpacked it, plugged in the power cord, used the supplied cable to connect the Squeezebox to my audio system, and blazed through the setup process. Using the supplied remote, I answered a half dozen questions posed on the screen of the Squeezebox. It automatically located my wireless network and prompted me for things like the encryption key; then I was done, ready to play music, as it automatically located my running copy of Slim Server, too! Later, I was able to go back to iTunes to setup Playlists, which the Squeezebox honors. And by the way, the Squeezebox also offers thousands of Internet radio stations, news feeds, nature sounds, and you can set it to shutoff automatically after x minutes. That's it. Now I am enjoying getting familiar with my CD collection again. I decided to "clean up" errors introduced during the import process by incorrect spellings and missing tags. For instance, I found one of the album compilations included a song by "Dianna Ross." This misspelling meant I later found two separate Artist entries for Ms Ross: one for Dianna and one for Diana. By selecting the song in iTunes, right clicking, and choosing Get Info, you can alter any of the tags recorded for the song. I also did things like sort by Genre and expand the listing of "Unclassifiable" to determine which songs had missing Genres. Whether or not you go to the trouble of examining all the compilations to break out the artists by song is up to you! I use the Pandora interface more than anything else. Unlike direct access to Pandora via a browser, there are no time limits on use.